This page is updated regularly with current special offers and there is also information below about Christmas and New Year at Ty Mawr. We currently have some vouchers for 20% off the standard entrance fee to the National Botanic Gardens of Wales. These are limited and will be allocated on a first come, first serve basis so do not forget to mention that you would like to take advantage of these tickets when booking your accommodation at Ty Mawr. Why not take over the whole hotel for a house party for your New Year?s Celebrations. For the past few years one group has had exclusive of the whole hotel at New Year which is always a great success and Ty Mawr are looking to repeat this format again. Ty Mawr has availability for a group of family and friends to stay - together you can unwind and enjoy the quiet unspoilt countryside, the good food and lovely old house. Although it is normally the policy at the hotel not to have children under the age of 10 years staying, if you have exclusive use, then this restriction can be lifted and three of the bedrooms have sofa beds. On New Year?s Eve a gourmet five course meal will be served with a complimentary glass of champagne at midnight. You may wish to extend your stay to more than one night and then the house party can be structured to meet your requirements. Food choices can be discussed ahead of your booking so that the menus are tailored to your needs. You may like to all sit down to the same meal one night and the number of courses can be extended if you wish. Ty Mawr can also organise quizzes if you are of the competitive nature or maybe you would like to take part in a murder mystery evening, car treasure hunt or horse racing party arranged at the hotel. If you reserve at least 5 of the 6 bedrooms Ty Mawr will guarantee to not take any other restaurant bookings during your stay so you will have exclusive use of the whole hotel at all times. 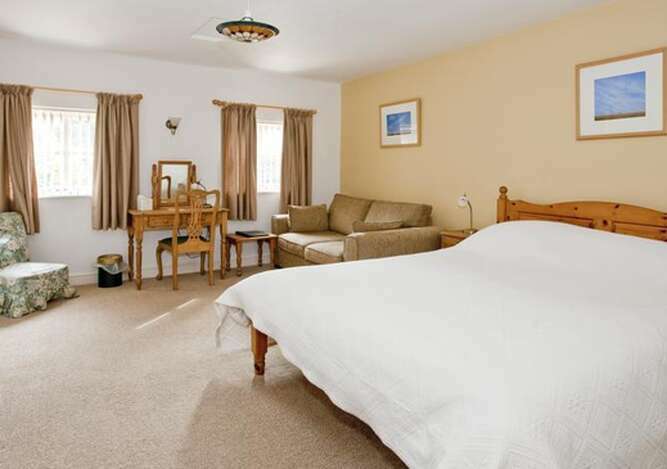 This year the price for two people on New Year?s Eve in a king size double or twin en suite is £220.00 per room (£235.00 in a superior room) for dinner, bed and breakfast. There is no venue charge for the exclusive use of the hotel or any extra expenses incurred if you wish to have a murder mystery party. Dinner, bed and breakfast will be £160.00/£175.00 per room per night if you wish to extend your stay for more than one night. In conjunction with Carmarthen Golf Club we have arranged a special discount for guests of Ty Mawr of £10.00 off the price of the usual green fees. The 18 hole course offers a parkland layout in the Gwili valley with breath taking views. There is also a 5 hole starter course, 8 bay driving range and practice putting green.